Badly affected by the earthquake, migrant workers now face difficulties to receive aid since they do not have residence permits. Jinde Charities, supported by Caritas, has managed to send staff and deliver vital aid to earthquake survivors in the Chinese Qinghai province despite snowy weather and transport difficulties. The remote region in North-West China was struck by a 6.9 magnitude earthquake on 14 April, leaving more than 2,000 people dead and more than 12,000 wounded. “Eight of our people have arrived in the earthquake region, the first were there two days after the quake. Among them are sisters who have special medical training or can offer counselling. Many of our staff have already worked with victims of the Sichuan earthquake two years ago,” reported Fr. Paul Han, vice director of Jinde Charities, from the coordination centre the charity set up in Chengdu, Sichuan. A first truck load with relief goods, mainly emergency food and tents, has arrived in the disaster-stricken region. Caritas Taiwan immediately sent several hundred quilts, jackets and shoes. More aid is on the way, but difficult weather conditions and long distances make transport difficult. “It is snowing, the roads are very slippery. Our staff have difficulties coping with the altitude. But we need to get aid to the people suffering from freezing temperatures up there. Aid is getting to the area around the epicentre, but people in the remote areas are suffering the most”, said Fr. Han. 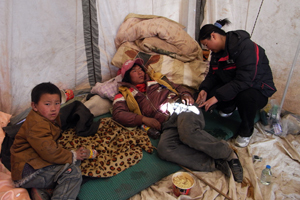 Jinde’s aid focuses in particular on poor migrant workers in the Daizha village. “In Daizha, where many migrant workers lived, 112 people were left dead so far out of a population of 12,000 people. The migrants’ housing conditions were poor, many of their houses collapsed,” said Fr. Han. Aid efforts are implemented through a cooperation of Jinde, Caritas Germany and Xi’an Catholic Social Service Center. Caritas is still running capacity building programmes in the Sichuan province of China two years after a devastating earthquake left over 87,000 people dead.